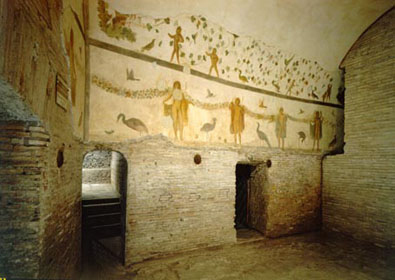 Discover the hidden gems of Rome: the catacombs, ancient creeds, underground dwellings and villas. Some of those buildings where built below the ground on purpose, some other have been eventually covered with rubble when they ceased to be functional and new buildings were built on top of them. The Catacombs are ancient underground cemeteries dug into the soft volcanic roman soil (tufa) outside the city limits. In Rome there are countless catacombs used both by the Christian community and the Jewish one. When the persecution of the christians came to an end, the catacombs were turned into sanctuaries, visited by the pilgrims to pray where so many martyrs were buried. Under the church of St. Clement, lies a 4th century early Christian basilica, down deeper there’s a Roman house dating back to the 3rd century and a building (insula) partly used as a mithreum plus a stream originally feeding Nero’s lake in the Colosseum valley. In the Trastevere district under the Basilica of St. Cecilia , lies a maze of rooms and alleyways, the oldest being a dwelling from the republican age remodelled into an craftsman’s shop, several brick tanks still visible, probably from a tanner’s. Excavations under the church of SS. John and Paul, revealed at least twenty frescoed rooms ranging from the 1st to the 4th century AD. It is the largest batch of residential houses from Roman time still existing and also the best preserved domus ecclesiae (a church that existed in private homes). The original frescos, both Christian and pagan, are still visible.